A study in Science Advances suggests that baby teeth may indicate the roots of autism and may possibly help with earlier detection. It’s now believed that the way infants metabolize zinc and copper may predict who will develop autism. Baby teeth hold a record of a child’s history of nutrient and chemical exposure. Using baby teeth, researchers found that children with autism contained more toxic lead and less zinc and manganese. Although years away, these biochemical signatures may potentially be used to develop diagnostic testing to identify autism much earlier and more objectively than we currently can. Read the study for yourself. A new study I read over the weekend in the August 2018 ASHA Leader finds that infants who were later diagnosed with autism exhibited marked changes in how their eyes react to sudden changes in light. Researchers noted that babies ages 9 to 10 months old who were later diagnosed with ASD had exhibited strong pupillary reactions when presented with sudden changes in light. Additionally, researchers noted that the magnitude of pupil constriction correlated with the severity of ASD symptoms. Read the study yourself at this link. 34% of parents believe that talking to children starts to benefit their language skills at a year old or later. 63% of parents say the benefits of talking begin at 3 months or older. Sadly, both groups are wrong. Learning language begins at birth… on DAY #1. As professionals, we need to share this information with every soon-to-be parent we know! Read more from this post at Zero to Three. Scientists have dubbed the term “technoference” to describe the small, everyday interruptions that occur during face to face interactions because of technology like television, computers, tablets, and the biggest offender – smartphones! When parents overuse technology, especially during daily routines like meals, bathtime, and bedtime, children show more frustration, hyperactivity, whining, sulking or tantrums. Sound familiar? What’s this mean for us as parents (and therapists!) of little kids with developmental differences? Instead of trying to design strategies to deal with these undesirable behaviors in kids, we should look at ourselves first! Studies say that adults spend on average 9 hours a day using devices – 3 hours of that is on a phone! While most of us need technology to do our jobs and keep up with other commitments, there are common sense solutions so that kids don’t suffer negative consequences due to our technology habits. Authors of the study suggested creating tech-free zones or times, especially during critical family routines like putting a child to bed and mealtimes. Many families implement “rules” like putting phones in a basket when entering these zones or placing their phones on silent so that no one is disturbed by constant alert signals. Another idea is downloading an app that will track technology use. This will allow parents to find out whether they are on their phones more often than they think and could motivate them to change their behavior when it comes to technology use. Does the baby respond to his or her name when called? The full article is an easy read and contains basic explanations for each of these areas: Worried Your Child Has Autism? My husband (and the other half of teachmetotalk.com!) showed me this online news article several weeks ago and I keep thinking about it and digging a little deeper. In my entire career, I’ve only seen a few kids with the official diagnosis of Fetal Alcohol Syndrome, now called Fetal Alcohol Spectrum Disorders (FASD), and all were adopted or in foster care. After reading this post and then looking at the study, I know there have been more! Experts previously believed that FASD affected a relatively small number of children at 1%, but a recent study estimates the number is as high as 3 to 10%. In this study published in Pediatrics, researchers concluded that 80% of the FASD cases are missed and 7% are misdiagnosed as something else. One of the study’s authors said that the most common FASD type,or partial FASD, has very subtle physical features, but significant neurobehavioral problems. These problems include decreased attention span, impulsiveness, and of course, learning differences. FASD is as common as autism. This is not what SLPs know about FASD. Perhaps I should say, it wasn’t what THIS SLP believed to be true! In updating my own information, I thought I’d pass it along to you too! In case you’re a little on the cynical side (that’s me too! ), here’s a post that questions the validity of the study due to limitations – including the reluctance of moms to report drinking during pregnancy. If you’d like to take a look at the original study, here’s that link at JAMA. Autism rates appear to be stabilizing in the US. According to a study in JAMA, rates did not rise significantly from data collected in 2014 through 2016. This was the first time rates did not increase in the past 20 years. In the US, prevalence rates are holding steady at 2.4% for children and adolescents. 3.54% of boys were reported to have ASD, compared to 1.22% of girls. Prevalence was 2.71% in white children, 2.36% in black children, and 1.78% in Hispanic children. Many news outlets are reporting these results WITHOUT reporting other factors could account for the steady rise in ASD diagnoses over the last two decades. These include changes in the way ASD is diagnosed, increased referrals for children with signs and symptoms, raised public awareness through intense media campaigns, and higher environmental risks. The latest prevalence estimates are 10 – 20% of 2 year olds. GENDER—Boys are at higher risk than girls. LATE WALKING – Late talkers have more motor delays when compared with typically developing kids. LOWER BIRTH WEIGHTS – Babies born with less than 85% of their optimum birth weight are more likely to talk late. PREMATURITY – Babies born earlier than 37 weeks gestation were found to be at higher risk for late talking. DELAYED EARLY LANGUAGE DEVELOPMENT – Language abilities at 12 months appear to be one of the better predictors of communication skills at 2 years. Toddlers who do not “copy” things other people do will not have the same language skills as peers who regularly engage in imitation. When toddlers don’t naturally begin to try to imitate others, it’s a red flag. We have to help them build their cognitive experiences through play and everyday activities so they have something to imitate! In most cases, we also have to spend time directly teaching them to imitate. This can be hard to do, but I can show you how! 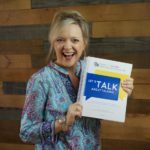 Check out my book Building Verbal Imitation in Toddlers. If you’re a therapist or need want to see in-depth examples with real kids with delays, take a look at my course Steps to Building Verbal Imitation in Toddlers. Bottom line… The words “evidence of harm” are serious! Rethink your patterns about screentime for little ones! It’s not as educational or as beneficial as we think! Read the full position statement at aap.org. Research tells us that 70 to 80% of late talkers will outgrow a language delay if it’s ONLY an expressive delay. This means no delays or red flags in other areas like receptive language or social interaction issues like fleeting eye contact or limited joint attention. This is good news, BUT it still means that 20 to 30% of kids will not catch up. This delay can significantly impact a toddler’s ability to learn academic skills like reading and writing since those skills are language based. Bottom line… don’t “wait and see.” Get intervention going as soon as you suspect a delay! You don’t want to regret not taking any action! 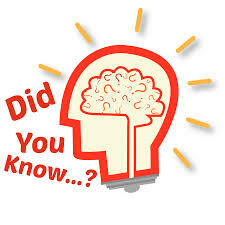 Did you know…experiences change a child’s brain! What you do with a child matters – even simple, everyday things like feeding her, giving him a bath, playing together, and even just talking as you hang around the house. ALL these things change the architecture of his or her little brain. This is good to know! This means that when we need to help a child learn something new that’s been hard (like TALKING! ), we can change how things are going by changing a child’s experiences. Things you do together with a late talker can make a big, big difference! I hope that inspires you today! Do you know the 2 factors most associated with kids with ASD who become functional communicators even after age 4? By functional communicator, the study specified that children attained phrases or fluent speech. It may not be what you think!! These data also implicate the importance of evaluating and considering nonverbal skills, both cognitive and social, when developing interventions and setting goals for language development. If you want to read the results for yourself, take a look here. I can help you with those strategies if you need some guidance! Teach Me To Play WITH You is an entire ‘how-to’ book for targeting social interaction with toddlers. Structured teaching and improving play skills are your BEST strategy for working on non-verbal cognition. Is It Autism? Treating Toddlers and Preschoolers with Red Flags for ASD has sections and directions for both. THIS CHILD KNOWS HOW TO TALK! We just need to tweak it so that he understands what he’s saying and can use all of those words to communicate with others. 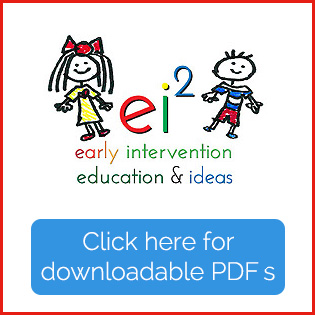 If you’d like more information about echolalia, I have some great resources for you! Read my post Echolalia…What It Is and What It Means for an explanation and description of echolalia. For very practical treatment ideas, read my post Echolalia…What To Do About It. There’s a great section about treating jargon and echolalia in my course Is It Autism? Treating Toddlers and Preschoolers with Red Flags for ASD. You’ll see examples and get an initial treatment protocol that’s been very effective for me in my work with young children. Did you sing today? I hope so! Do you want to know why? This means that singing is an EVIDENCE-BASED PRACTICE. Every single time you break into song with a child, you’re helping build the circuitry for social and language development. You’re setting the stage for WORDS. Not to mention, singing with children has tons of other benefits too that encompass all areas of early development including physical, cognitive, and literacy skills. Still need more evidence? Check out this article from zerotothree.org – Beyond Twinkle Twinkle: Using Music with Infants and Toddlers. 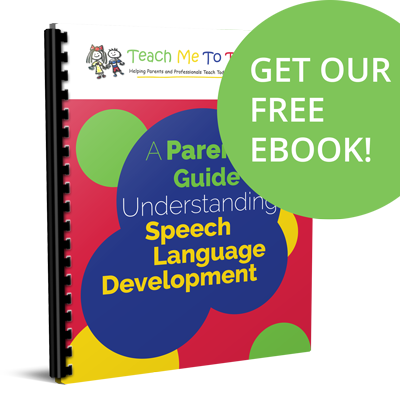 It’s well-known among speech-language pathologists that gestures precede words in language development. Toddlers who produced a gesture for a particular object learned to say that word (on average) 3 months later. When we see a toddler show us, give us, or point to an object, his little system is ripe for learning! It could just be that he “needs” that word and is more receptive to learning it. It could be that he’s revving up himself to be able to retain the word to talk about it. Yes, my little friend, we will! If you want to know more about the importance of gestures and language development, check out my post Gestures Predict First Words. A brand new study released in May confirms what we pediatric SLPs who specialize in early intervention already know…. Toddlers who use handheld devices (like an iPad or a smart phone) are at significant risk for expressive delays. This study found that on average, by age 18 months 20% of toddlers spent 28 minutes per day using a device. For each 30-minute increase in handheld screen time, researchers found a 49% increased risk of expressive speech delay. Translation… if a toddler spends an hour a day on a tablet or phone, he’s much, much more likely to be a late talker. Read a summary of the study for yourself here. the critical window for learning language is birth to 5. Around age 5, a child’s brain is already hard-wired for many things language-related, including grammar and pronunciation. This is why early intervention is so important when we suspect or identify a language delay. “Wait and see” is never, ever a good idea. Get in there and get language going! Read more about brain development in children at Zero to Three.